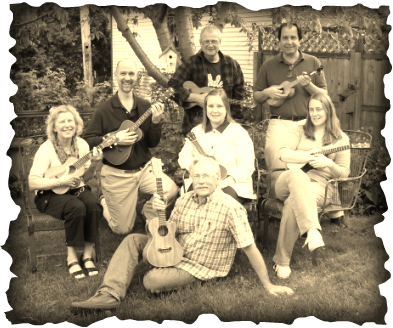 The Madison Ukulele Club ..."to vicinity and beyond !" In 2008, shortly after purchasing his first ukulele, retired photographer Dan Johnson wished he had a few other Madison folks with whom to sing and strum. Ironically, he found them in Milwaukee ...while attending an annual Ukulele Festival. Unbeknownst to him, fellow Madisonian Susan Jensen was also attending the Festival; she had just recently begun attending a ukulele class back in Madison and her fondness for the instrument was causing her to explore the landscape. Susan and Dan connected in Milwaukee, 70 miles from home, and then transplanted the seeds for a Madison group upon returning. Dan brought in a few other folks with flyers he hung up around Madison. But momentum of the budding group really got a boost when Susan shared her discovery with her classmates. A significant number of them jumped on board and the "Madison Ukulele Club" was born. A core group quickly emerged. They were unique in both their mutual rapport and their mutual commitment to exploring the accessible versatility of this instrument. Over the next couple years, the core group grew to roughly a dozen members. A decision was made to limit the size of the group so they could continue to comfortably, and practically, rotate gatherings among member's homes. It was around this same time that Dan hatched the acronym MAUI, but couldn't quite make it fit ...yet. In Spring of 2011, Andrew Wilke, one of the original core group members, decided to pursue an idea that had been kicked around in the group for several months, namely a second, parallel group unlimited in size. Indeed, he and others began to wonder just how many ukulele enthusiasts could be teased out of their homes and assembled into one large, local, musical community. The quest had begun, and Andrew suggested completing the MAUI acronym by linking it to this emerging "initiative". Marketing efforts were increased and a monthly Sunday sing-along was created, with membership growing to approximately 50 people in the first 5 months. Presently, Andrew facilitates multiple sing-alongs each month, which are more structured than the original Wednesday gatherings to accommodate the dynamics of larger groups. The initiative continues ... with ever-evolving plans to broaden ways in which MAUI can serve its purpose of creating vibrant, ukulele-based, musical community in the Madison area. We welcome your ideas for how to best accomplish that; feel free to drop us a note through our "Inquires" page. Thanks for coming to visit !